Yesterday I gave the kinders a math paper I made that had sea animals and they had a few number sentences to solve. Once they knew the answers, they knew what to color for each number. One little girl sat down next to me and was so excited about the paper. "Ms. T! I love this! It's so cuuute! And I can do these number sentences!" She leaned over, hugged me, and gave me a peck on the cheek and hopped back over to her table to work on her math. I sat there smiling from the loving she gave me. I don't think I've ever had a student kiss me lol, I was kind of shocked. But I was very happy wither her using math terminology! Here she is, ready to start the race. She's the one in the purple. 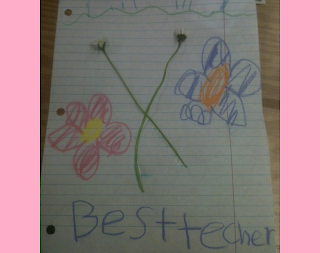 Best Teacher is what it says and two dandelions glued in the middle. 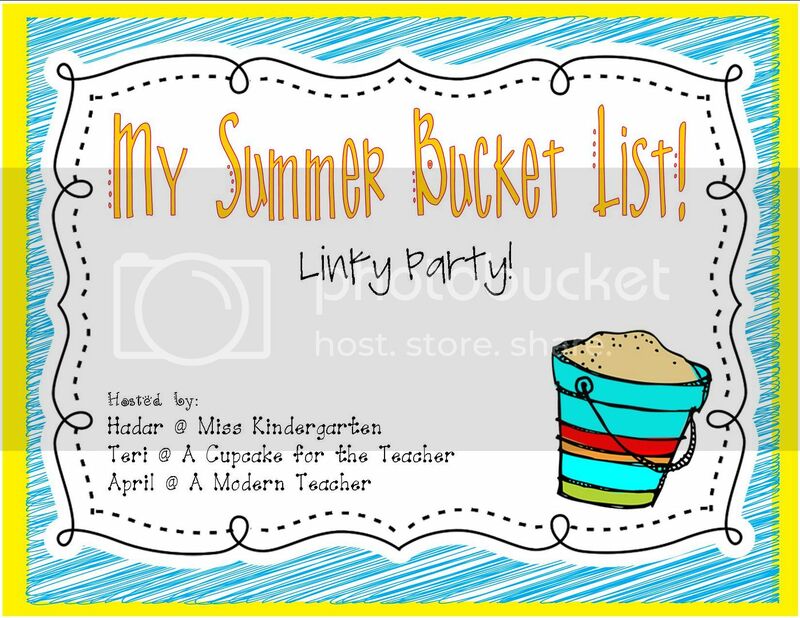 I'm finally joining the Summer Bucket List Linky, yay! Thanks Teri, Hadar, and April! 1. I want to work on more units for my TN store. I've been in a creative slump again, but I'm sure I'll be inspired with all my time off! 2. I just got this book from Amazon. 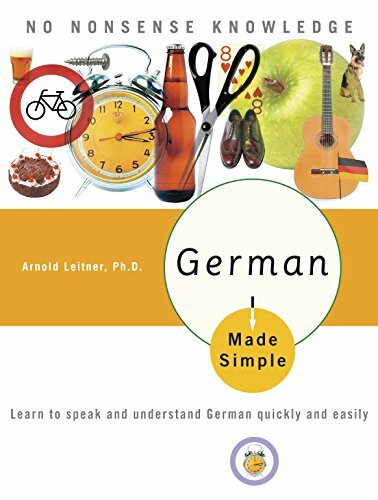 I'm 1/2 German and I know more German than I can speak, so I'm determined to speak more. There are exercises in this book that I'll do a few each day (or week lol). 3. I want to do more DIY things and recipes from Pinterest. My boards are in pretty good shape so I don't think I'll need to organize them. 4. I really want to make this. 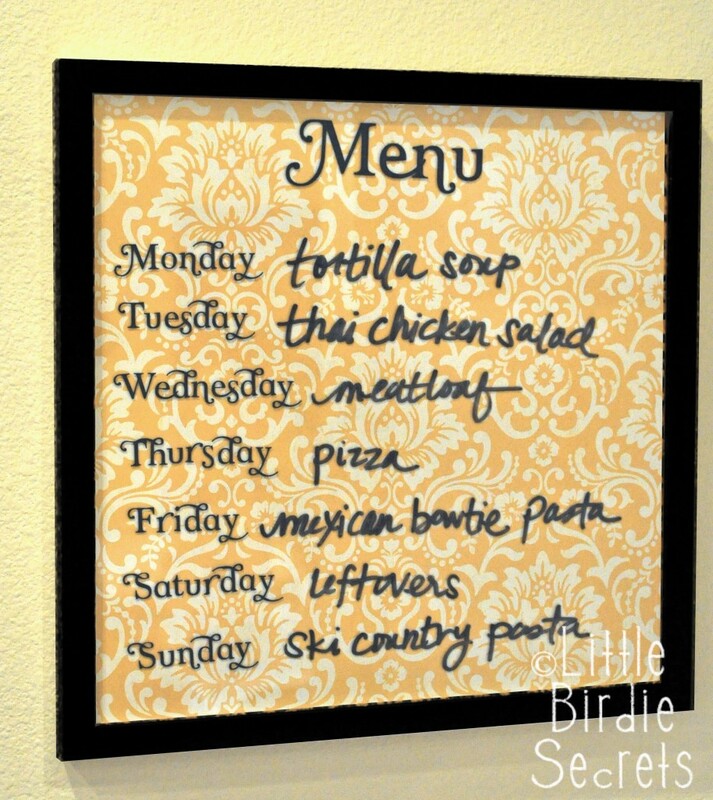 Or make it a calendar for the week (or month. I saw one with paint chips for a monthly calendar). 5. I found my copy of the The Book Whisperer that I bought last fall when the Borders I go to was closing. And I bought The Five Love Languages of Children on sale at another store that was liquidating. I've heard so much about The Five Love Languages, that I knew I had to have this one for kids. So I want to read both books. Anyone else have The Five Languages book? I'd love to talk about it with others! 6. I hope to make a day trip or two to the beach. 7. I want to organize my bedroom. Tomorrow I'll do another linky that I saw :) Happy Weekend! Aw thanks Jen! I'll hop on over! The Book Whispere is on my list too! How sweet she gave you a kiss. I've had a little boy steal a kiss because he had a big crush on me, lol! !